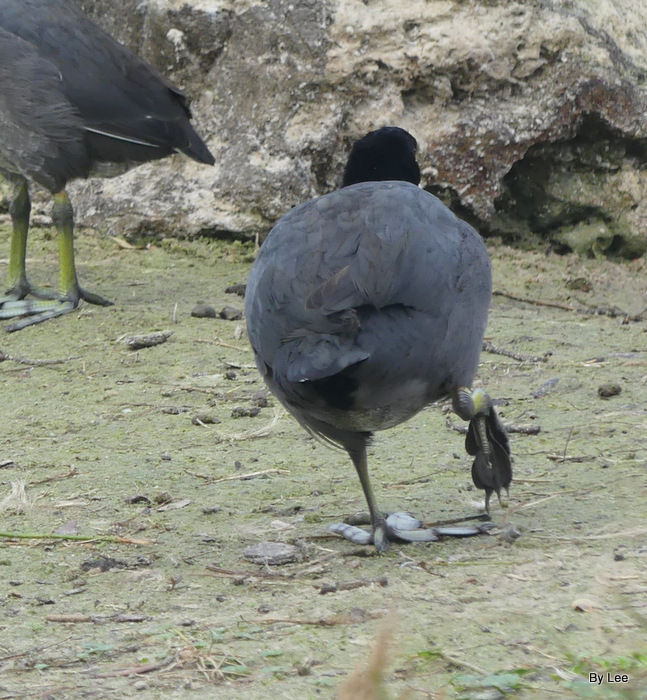 There the Coot Goes, on Weird Lobed Toes! Weird toes are not limited to birds. In the Philistine territory of Gath there once was a giant both of whose feet had 6 toes thereon (as well as 6 fingers on both of his hands). But, in the case of the American Coot, the “weird toes” are not a genetic birth defect — in fact, the American Coot’s toes are designed to be weird, yet wonderful at the same time. And more recently, a creation science article elaborates on just how special those feet are. Specifically, Dr. Glen W. Wolfrom has authored a succinct study titled “Amazing ‘Feats'”, in the column All by Design, CREATION MATTERS, 23(6):12 (November-December 2018), parts of which are quoted hereinbelow. “The American Coot [referring to Fulica americana] has feet that are so odd-looking that Shweta Karikehalli , the author of an online Audubon article [Karikehalli’s “Better Know a Bird: The American Coot and its Wonderfully Weird Feet”, AUDUBON, August 13, 2018, posted at https://www.audubon.org/news/better-know-bird-american-coot-and-its-wonderfully-weird-feet ], described the bird’s appearance as ‘wacky’. Each of its oversized toes has two or three greenish-to-yellowish ‘fleshy lobes’ that are connected to its long legs. When in water, these [toe] lobes function much like the webbing on ducks’ feet. But on land, walking is assisted by the lobes’ folding out of the way. 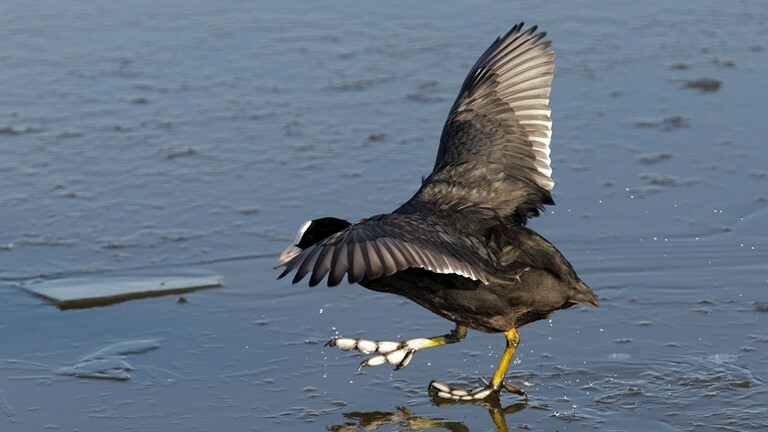 According to Karikehalli, the coot’s uniquely-designed foot thus makes the bird more adept than most other waterfowl at getting around on both land and water. A few other water birds (some grebes and phalaropes) also have lobed toes, but none have lobes that are as large as those of the coot. So, what can we learn from this clever bioengineering design (of the coot’s lobed toes), and its habitat-friendly performance in the wild? God’s innovative body plan for the American Coot, with all of its providentially purposeful details, is irrefutably magnificent. 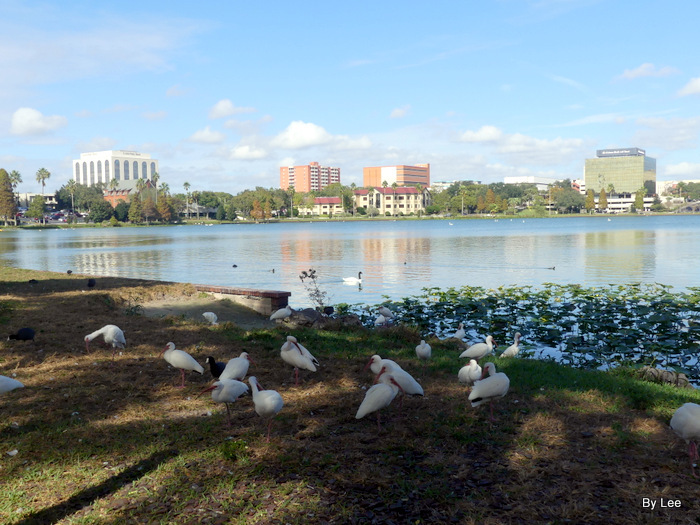 We made a short birdwatching trip over to Lake Morton in Lakeland, FL recently. Dan wanted to check out something with his camera and of course I tagged along. As I have mentioned lately, my back is acting up, so I just walked about 40 feet and sat on a bench. It is amazing what you can see at the lake just sitting in one spot. I was about that far from the shore to watch all the activity swimming by. 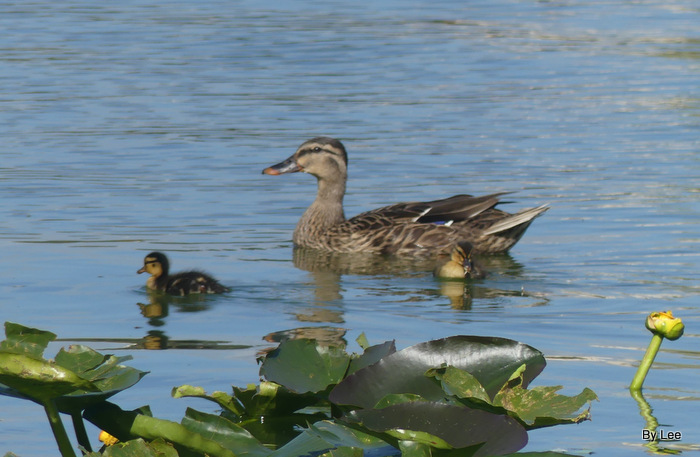 First I was greeted with a momma Mallard swimming with her to babies. 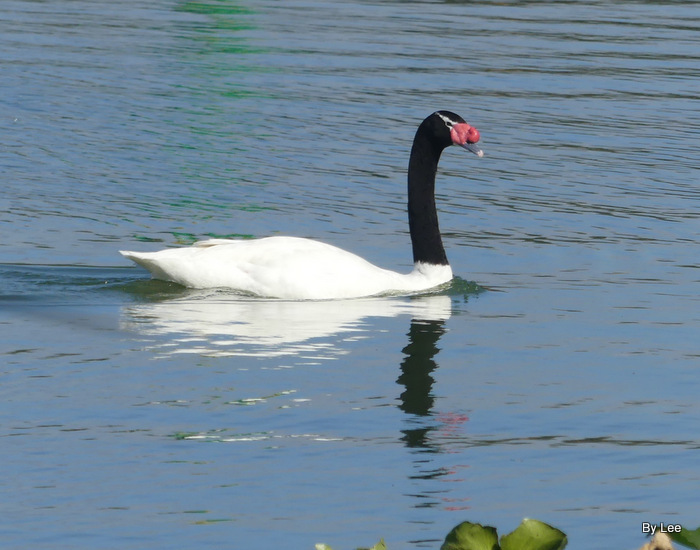 Then a Black-necked Swan went the other way. It always amazes me how they can walk without stumbling over their own feet. Their feet are so useful in the water, but on shore they seem “weird” to me. See Birdwatching – American Coot. 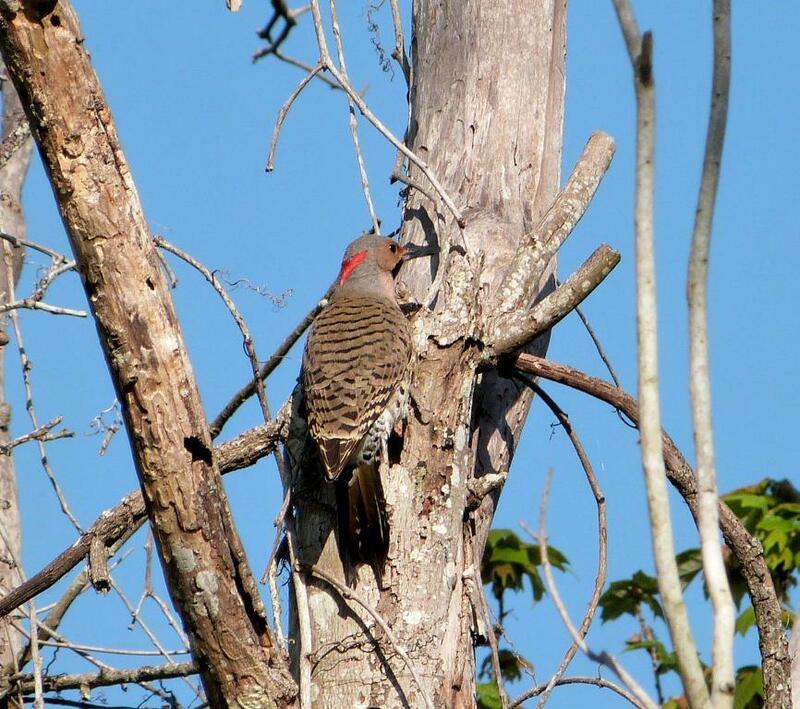 The last bird we watched before leaving was a favorite around here. 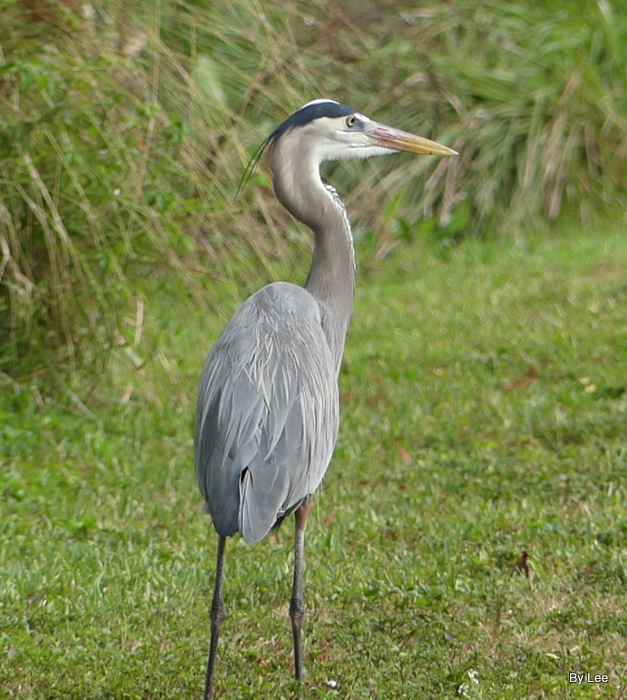 A Great Blue Heron stopped by. There were other birds around, but for now, this gives you a little bit of my latest blessings from birdwatching. Not bad birdwatching for just sitting in one spot. The Lord is Good. 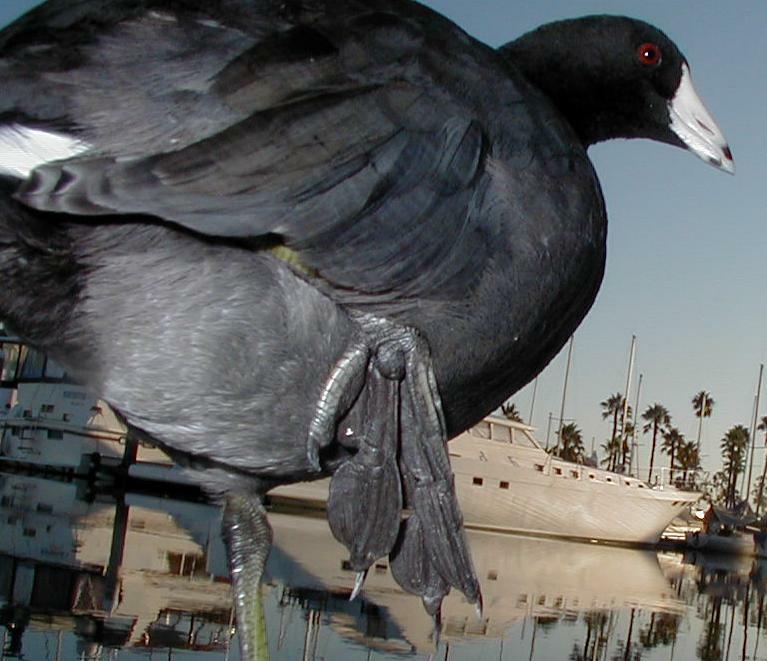 As the following study of the American Coot shows (which begins our review of birds having names that begin with “C”), God has employed creatively clever bioengineering into the form and function of American Coot feet. How much moreso, as creatures made in His image, should we appreciate His design-and-construction engineering genius, as it is displayed in our own feet and toes! As noted in the preceding “Part 1” of this series [see ], “C” is for as Cardinal, Chicken [regarding which fowl, see Flag That Bird – Part 1 ], Coot, Cormorant, Chicken, Coot, Chickadee, Caracara, Crane, Cuckoo, Curlew, and Corvid (including Crow and Chough) — plus many other birds with names that begin with the letter C! 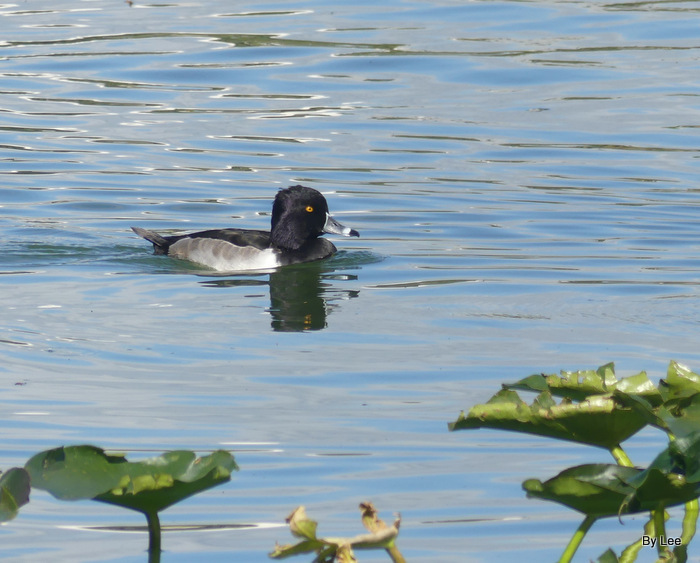 In this “Part 2” review of “C” birds, however, the red-eyed American Coot (a/k/a marsh hen, mud hen, water hen, and poule d’eau, i.e., “water chicken”), as well as the crow-like birds that we collectively label as Corvids, will be featured. Because the American Coot is a wetland “rail” (i.e., classified with the mostly-wetland-or-forest-associated birds, such as gallinules and crakes, that are “ground-living” – as opposed to dwelling in trees), it is often seen and appreciated by birdwatchers (like Chaplain Bob Webel, of St. Petersburg, and his wife, Marcia) who live at the vegetated edge of a freshwater lake or pond, or by brackish estuarial marshland or swampland. [Quoting Herbert S. Zim & Ira N. Gabrielson, Birds, A Guide to Familiar American Birds (New York, NY: Golden Press, 1987 rev. ed. ), page 34.] 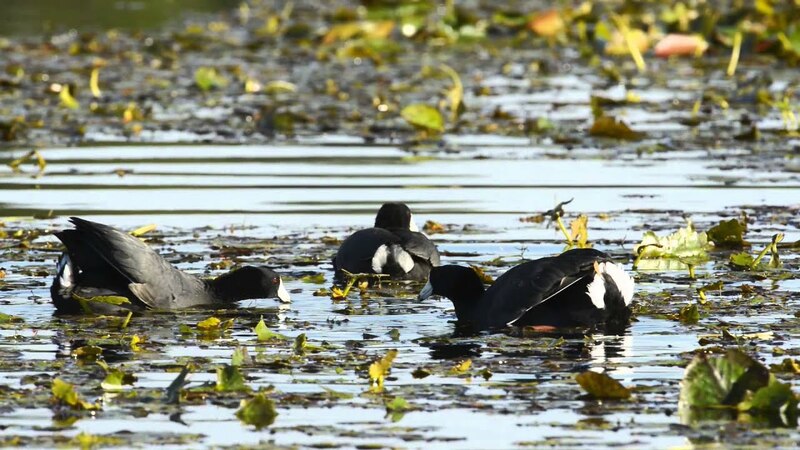 As the youtube video-clip (below) shows, American Coots can skim and scoot across the surface of a lake or pond, flapping just over the water surface, when they want to move quickly. Unlike ducks, however, the coot has no webbed feet. Rather, coots have long toes that sport broad lobes of skin, designed for kicking through the water, almost like synchronized mini-paddles. 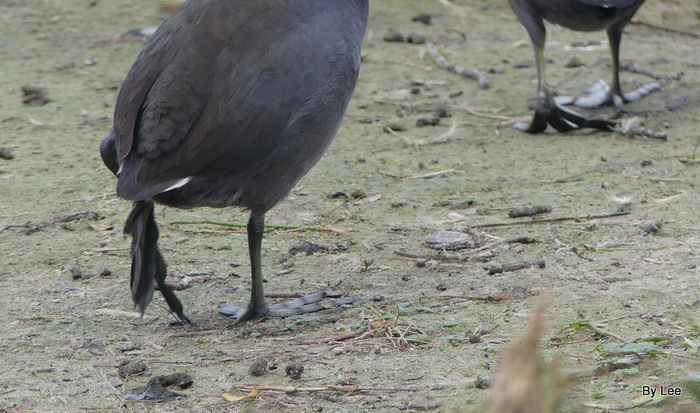 These conspicuously broad foot-lobes fold backward, when a coot walks on dry land, so the foot-lobes don’t interfere with the ground surface contact – yet the foot-lobes can be used to partially support the weight of the coot (by spreading body weight over a larger surface area, like snow-shoes) when the “mud hen” travels across mucky mud (or even on thin ice!). 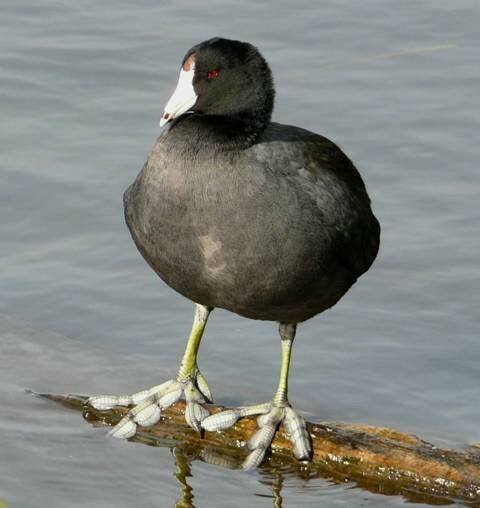 In other words, God designed coot feet to fit the wet habitats that they fill. 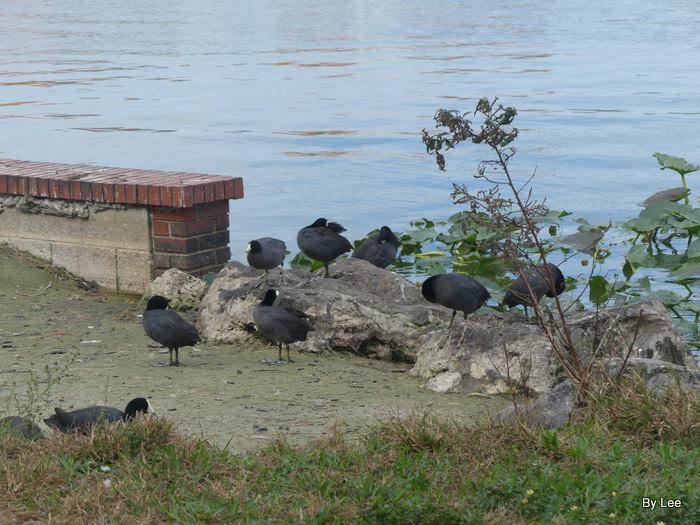 Coots are gregarious, “socializing” with themselves and with other waterfowl. 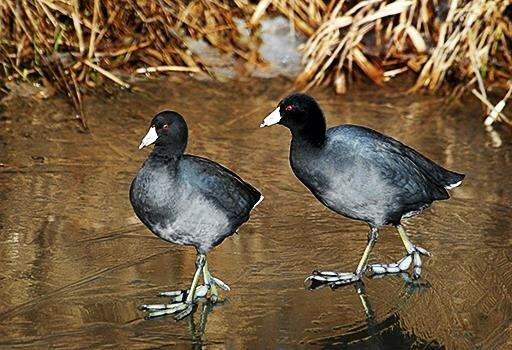 IN particular, coots are share space, as they “fill” a wetland or aquatic habitat. 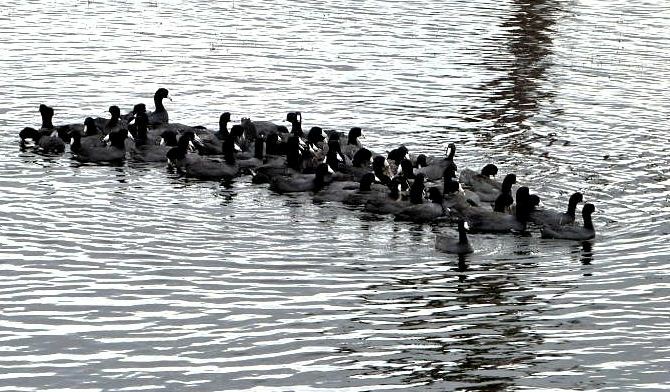 Families of coots — or even larger groups of coots — often mixed with other waterfowl (like ducks) may compose a “raft” of hundreds or even thousands! [See, accord, American Coot entry at CORNELL LAB OF ORNITHOLOGY, “All About Birds”, with Herbert K. Job, BIRDS OF AMERICA (Doubleday, 1936), pages 214-215, both cited within Steve Bryant, “American Coot”, in OUTDOOR ALABAMA. American Coot, with young, eating aquatic plant. 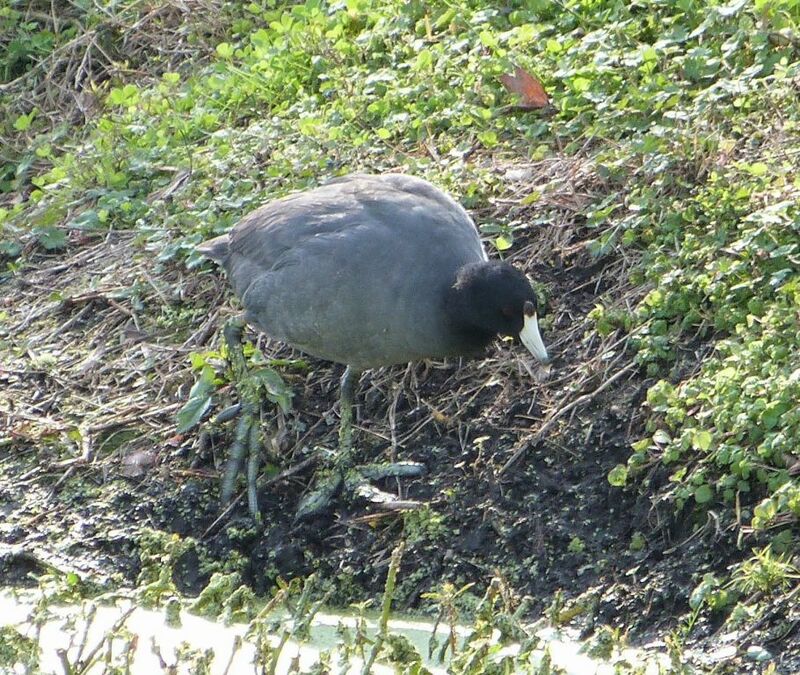 So what do American Coots like to eat? But American Coots are not the only common bird dominated by black plumage. 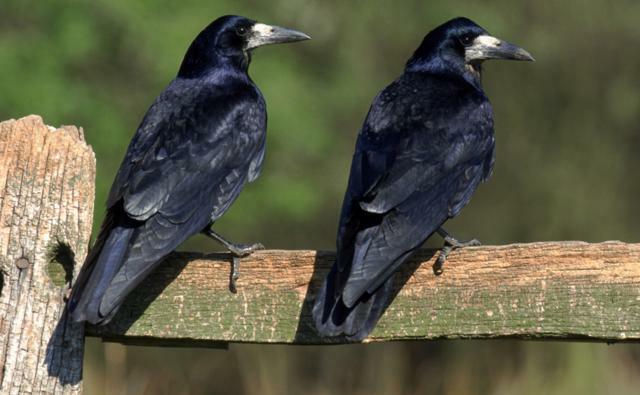 Consider the common crow, or the raven — both of which belong to another group of “C birds”: CORVIDS, an amazingly intelligent group of crow-like songbirds, including the likes of crows, ravens, jackdaws, rooks, choughs, jays, treepies, magpies, and nutcrackers. For a few examples, consider that Lars Jonsson’s BIRDS OF EUROPE (Princeton University Press, 1993), pages 487-495, includes the following corvids of Europe: Siberian Jay, Eurasian Jay, Spotted Nutcracker, Eurasian Magpie, Azure-winged Magpie, Alpine Chough, Red-billed Chough, Jackdaw, Common Raven, Brown-necked Raven, Fan-tailed Raven Carrion Crow, Hooded Crow, and Rook. In North America we can expect to find corvids quite terrific, ranging from the Atlantic to the Pacific: American crow, Northwestern Crow, Common Raven (including the subspecies “Western Raven”), Green Jay, Blue Jay, Steller’s jay, various scrub jays, Grey Jay, Black-billed Magpie, Yellow-billed Magpie, Yucatan Jay, Pinyon Jay, Clark’s Nutcracker, and more! 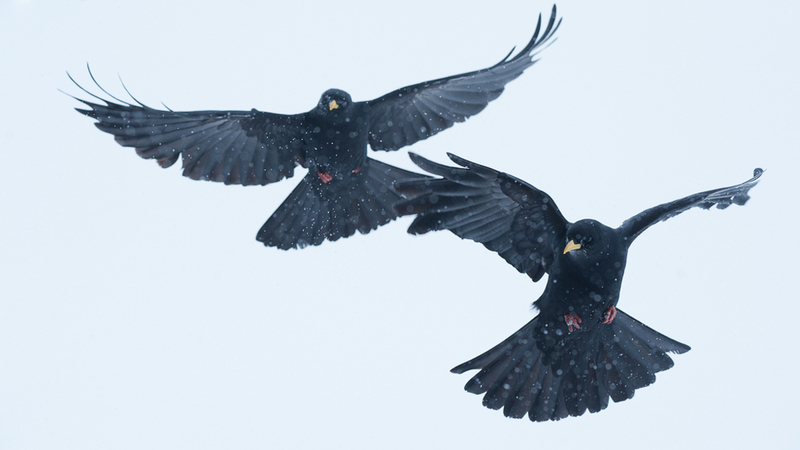 For general information on corvids, see ornithologist Lee Dusing’s insightful birdwatching articles: “Corvidae — Crows, Jay”, listing more corvids that you or I will ever witness in this lifetime! — as well as Lee’s “Birds of the Bible – Raven I”, Lee’s “Birds of the Bible – Raven II”, and Lee’s “Birds of the Bible – Raven III”. “Providential Planting: The Pinyon Jay”, CREATION EX NIHILO, 19(3):24-25, summer AD1997. 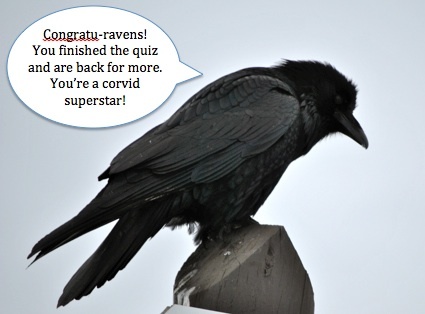 Of course, many books could be — and, in fact, have been — written about corvid birds. But this article is already long enough. 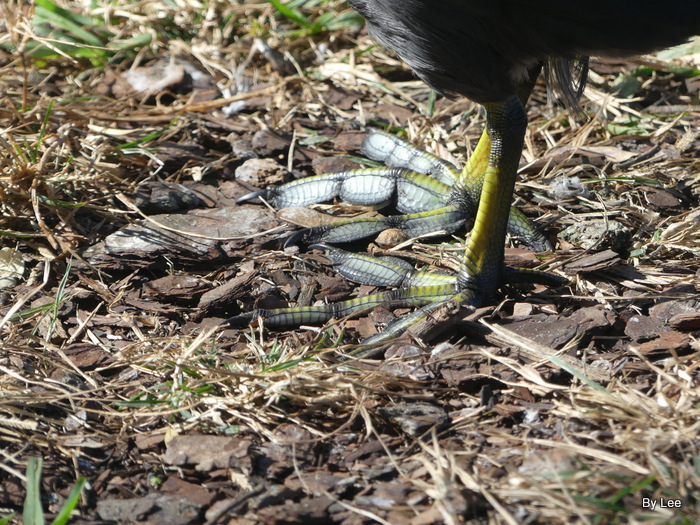 Like Dr. Jim’s article above, I have also been fascinated by the feet of the American Coot. 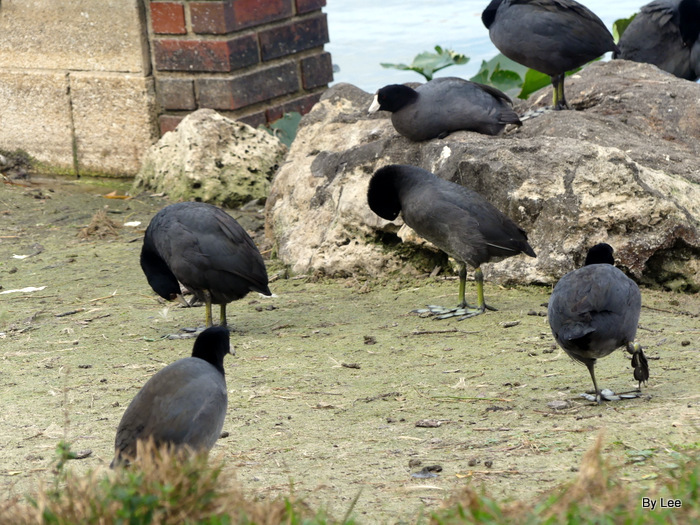 See Birdwatching Term – Lobed Feet and Birdwatching – American Coot where I have a video of one walking down to the shore. He almost steps on his own feet. Dan and I went birdwatching last week at South Lake Howard Nature Park here in Winter Haven. We just stopped by on the way home from an errand. Captured a Northern Flicker with the camera, but the video is of the Coot’s feet. I have trying to get a photo of them because they are so different from other bird’s feet. Their feet are not webbed, but sort of flattened out. We only see them down here in the winter. See the Wikipedia information below. Apparently it helps them walk on the land, but it seems that a soft soil just under the water would be “squishy” and that may help their footing. Isn’t it neat how the Lord, in Him wisdom, provided for them in such a way. The American Coot (Fulica americana) is a bird of the Rallidae – Rails, Crakes & Coots Family. Though commonly mistaken to be ducks, American Coots come from a distinct family. 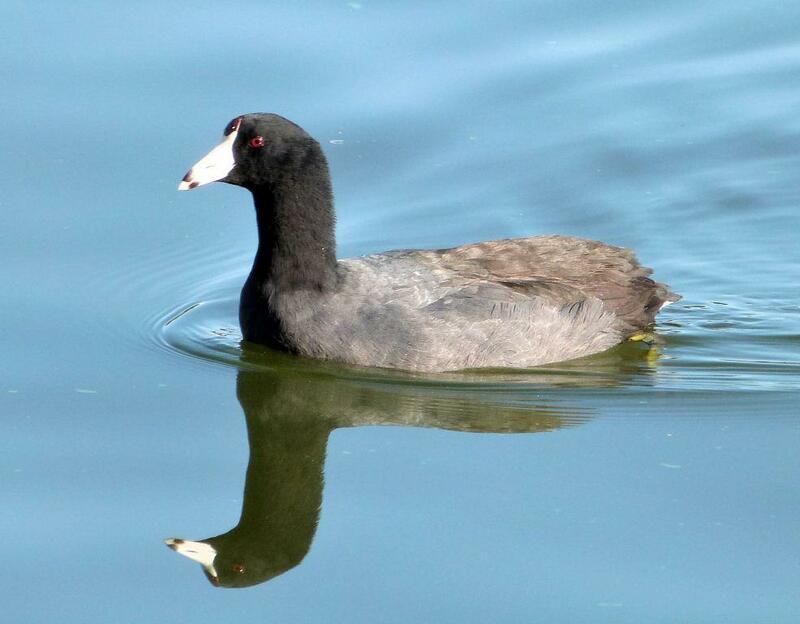 Unlike ducks, Coots have broad lobes of skin that fold back with each step in order to facilitate walking on dry land. They live near water, typically inhabiting wetlands and open water bodies in North America. 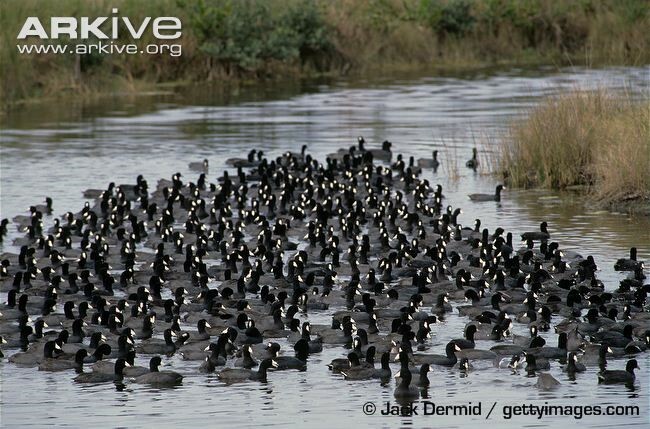 Groups of these black-feathered, white-billed birds are called covers or rafts. The oldest known Coot lived to be 22 years old. The American coot is a migratory bird that occupies most of North American. They live in the Southwestern United States, Mexico, and the pacific coast year round, and only occupy the northeastern regions during the summer breeding season. 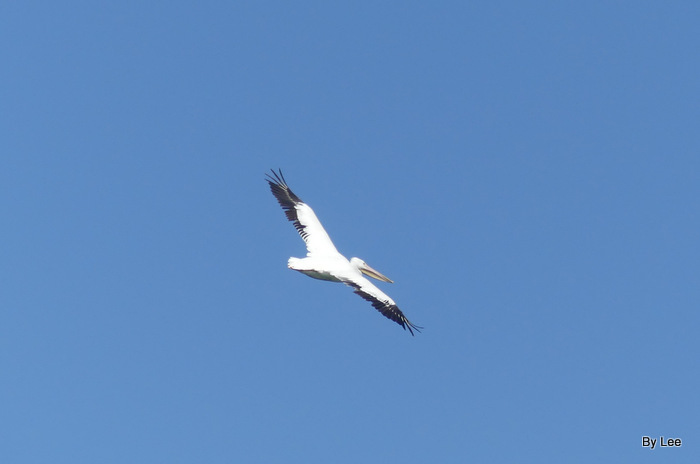 In the winter they can be found as far south as Panama. They generally build floating nests and lay 8-12 eggs per clutch. American coots eat primarily algae and other aquatic plants but they do eat animals (both vertebrates and invertebrates) when available. Much research has been done on the breeding habits of American Coots. Studies have found that mothers will preferentially feed offspring with the brightest plume feathers, a characteristic known as chick ornaments. 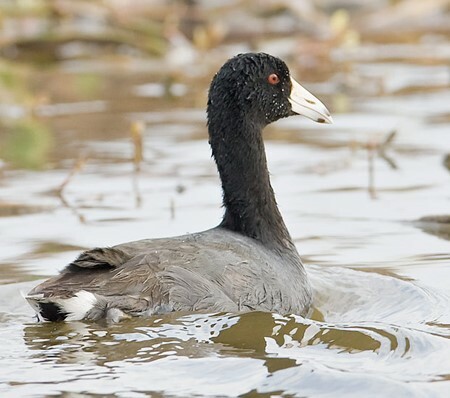 American coots are also susceptible to conspecific brood parasitism, and identify which offspring are theirs and which are from parasitic females. See the Sounds page of All About Birds for the American Coot. 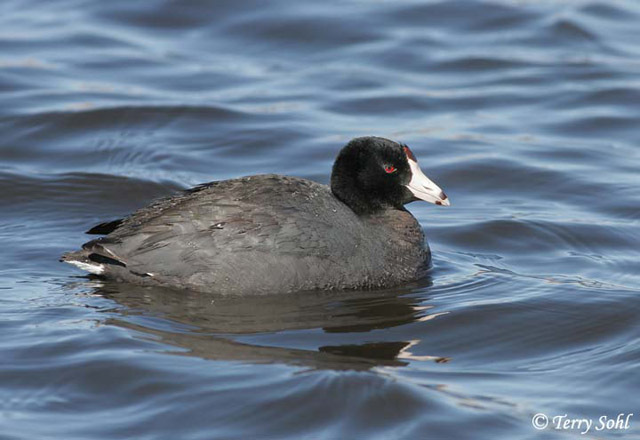 American Coots are found near water—reed-ringed lakes and ponds, open marshes, and sluggish rivers. They prefer freshwater environments, but may temporarily live in saltwater environments during the winter months. The American Coot can dive for food but can also forage and scavenge on land. It is omnivorous, eating plant material, arthropods, fish, and other aquatic animals. Its principal source of food is aquatic vegetation, especially algae. During breeding season, Coots are more likely to eat aquatic insects and mollusks—which constitute the majority of a chick’s diet. The American Coot is a prolific builder and will create multiple structures during a single breeding season. It nests in well-concealed locations in tall reeds. There are three general types of structures: display platforms, egg nests and brood nests. Egg nests are typically 12 inches in diameter with a 12-15 inch ramp that allows the parents to enter and exit without tearing the sides of the nests. Coots will often build multiple egg nests before selecting one to lay their eggs in. Brood nests are nests that are either newly constructed or have simply been converted from old egg nests after the eggs hatch. They are simply larger egg nests. Egg and brood nests are actually elaborate rafts, and must be constantly added to in order to stay afloat. Females typically do the most work while building. 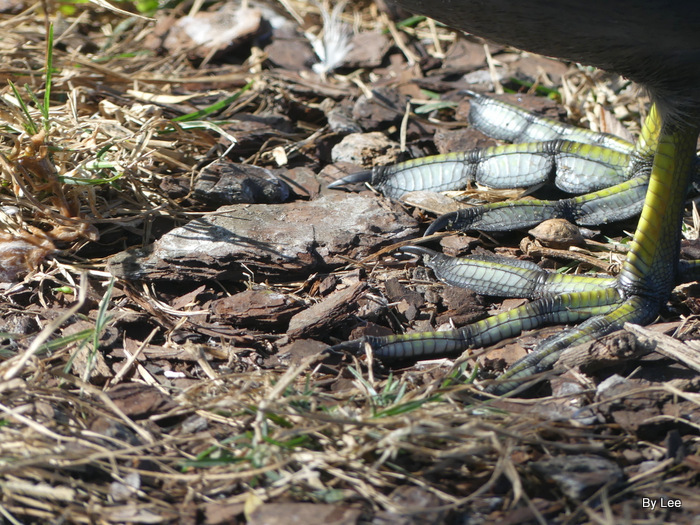 Females deposit one egg a day until the clutch is complete. Eggs are usually deposited between sunset and midnight. Typically, early season and first clutches average two more eggs than second nesting and late season clutches. Early season nests see an average of 9.0 eggs per clutch while late clutches see an average of 6.4 eggs per clutch. There is an inverse relationship between egg weights and laying sequence, wherein earlier eggs are larger than eggs laid later in the sequence. It is possible to induce a female Coot to lay more eggs than normal by either removing all or part of her clutch. Sometimes, a female may abandon the clutch if enough eggs are removed. 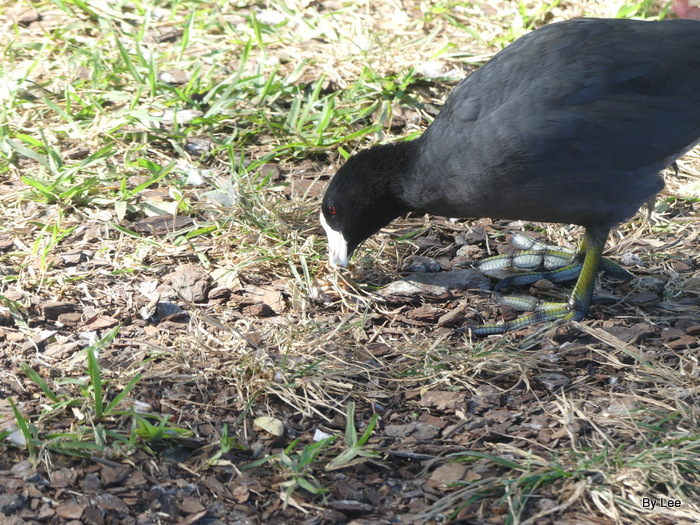 Coots, however, do not respond to experimental addition of eggs by laying fewer eggs. 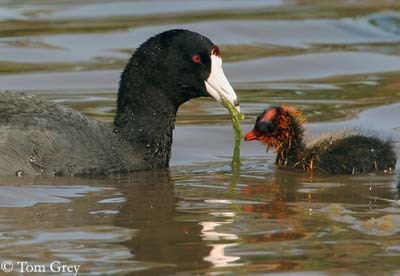 Chick recognition reduces the costs associated with parasitism, and Coots are one of only three bird species in which this behavior has been observed. This is because hatching order is predictable in parasitized Coots—host eggs will reliably hatch before parasite eggs. In other species where hatching order is not as reliable, there is a risk of misimprinting on a parasite chick first and then rejecting their own chicks. In these species, the cost of accidentally misimprinting is greater than the benefits of rejecting parasite chicks. The first evidence for parental selection of exaggerated, ornamental traits in offspring was found in American Coots. Black American Coot chicks have conspicuously orange-tipped ornamental plumes covering the front half of their body that are known as “chick ornaments” that eventually get bleached out after six days. This brightly colored, exaggerated trait makes Coot chicks more susceptible to predation and does not aid in thermoregulation, but remains selected for by parental choice. These plumes are not necessary for chick viability, but increased chick ornamentation increases the likelihood that a chick will be chosen as a favorite by the parents. Experimental manipulation of chick ornamentation by clipping the bright plumes have shown that parents show clear preferences for ornamented chicks over non-ornamented ones. In culture – On the Louisiana coast, the Cajun word for coot is pouldeau, from French for “coot”, poule d’eau – literally “water hen”. Coot can be used for cooking; it is somewhat popular in Cajun cuisine, for instance as an ingredient for gumbos cooked at home by duck hunters.